CHICAGO--(BUSINESS WIRE)--Jul. 15, 2014-- Hyatt Hotels Corporation (NYSE: H) and HPV S.A. today announced the opening of Hyatt Place Santiago/Vitacura in the city of Santiago, Chile. The opening marks the second Hyatt-branded hotel in Santiago and introduces the Hyatt Place brand to Chile and the South American continent. The first Hyatt Place hotel outside the United States debuted in Central America with the 2012 opening of Hyatt Place San Jose/Pinares in Costa Rica. The Hyatt Place brand has since grown its brand presence in Latin America and the Caribbean with locations in Puerto Rico, Mexico and now Chile. Expansion is set to continue in the region later this year with anticipated Hyatt Place hotel openings in Mexico and Panama. As Chile continues to cement its rank of being one of the best places to do business in Latin America, backed by its 2013 designation as such by The World Bank, the country is an important business and leisure market for Hyatt. The opening of Hyatt Place Santiago/Vitacura is an important step in Hyatt’s growth in strategic gateway and regional markets throughout Latin America. 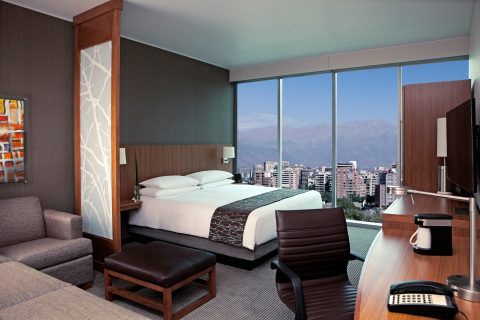 Hyatt Place Santiago/Vitacura is an upscale, select service hotel designed for multi-tasking travelers. The hotel is located in the upscale Santiago neighborhood of Vitacura, conveniently located 20 minutes from Arturo Merino Benitez International Airport on Americo Vespucio Avenue. Business travelers will find the hotel located within minutes of Santiago’s three main business districts: Nueva Las Condes, El Golf, Providencia and Ciudad Empresarial. Travelers of all kinds can find local attractions within close proximity such as the Museum of Fashion, Historic Quarter, Municipal Theater, Fine Arts Museum, and San Cristobal Hill. Hyatt Place Santiago/Vitacura is within walking distance to Alonso de Cordova Avenue shopping, as well as Parque Arauco Shopping Mall, which offers an array of restaurants, shopping and entertainment options. Hyatt Place Santiago/Vitacura is under the leadership of General Manager Sergio Ortiz and Director of Sales Maria Paz Vacarezza . In his role, Mr. Ortiz is directly responsible for managing the day-to-day operations of the hotel, including overseeing the hotel’s more than 50 associates and ensuring guests encounter the purposeful service for which Hyatt Place is known. Ms. Vacarezza is responsible for providing sales service and support to travelers and meeting planners frequenting the Santiago/Vitacura area. For Hyatt Place Santiago/Vitacura information in English and Spanish, or to make a reservation, please visit www.santiagovitacura.place.hyatt.com.